You probably don't need a scientist to tell you that winter is really rough on your skin. But just in case there was any doubt (maybe that cracked, dry feeling is all in your head? ), researchers in Denmark and the Netherlands decided to prove it. Turns out, it's true. And the farther you get from the equator, the worse winter can be for your skin. The researchers conducted a literature review to determine just why this happens. What they found wasn't surprising, but it does highlight the need to take extra care of your skin right now. They found that a lot of it has to do with the moisture (or lack thereof) in the air. The lower the humidity and the temperature, the worse your skin barrier performs. This leaves your skin vulnerable to stress and increases your risk of dermatitis. You'll also experience an increase in inflammatory activity and the stress hormone cortisol, which will make you more likely to react to irritants and allergens on your skin. This is not a pretty picture. What steps can you take to overcome these factors? To start with, try to avoid exposing your skin to extremely cold temperature. Dry air is harder to avoid, especially with heaters constantly running to help you stay warm. So the solution is to give your skin moisture. However, you can't be constantly reapplying moisturizer all day. You need to give your skin something that will not only give it the moisture it needs, but also enables it to hold onto that moisture. Système 41 Day Crème and Restorative Night Treatment not only contain powerful moisturizers, they contain white tea leaf extract, olive squalene oil, hyaluronic acid and phospholipids to help you retain moisture longer. Rather than feeling your glow evaporate throughout the day only to be replaced with that dry, tight feeling, you'll keep moisture locked in and protecting you. Don't forget your lips either. It's hard to protect your lips from the cold, and their thin skin means they're easily irritated. Système 41 Lip Therapy can help you seal in moisture here as well. Many conventional lip products contain ingredients that may feel cooling, but actually dry your lips out. And, in the winter, more coolness and dryness is the last thing you need. This treatment is full of oils and vitamins to give you lasting moisture that you won't feel the need to reapply every 10 minutes.You can purchase these products by visiting www.systeme41.com. 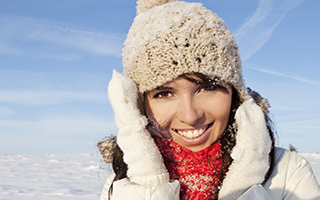 Winter can be harsh for your skin, but it's full of other great opportunities to make happy memories. With the right products, you can stop worrying about your skin and get back to enjoying your crackling fire, hearty bowl of soup, or even a snowball fight with your kids or grandkids.